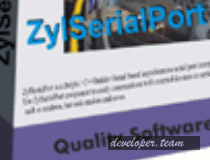 ZylSerialPort.NET is written 100% in C# using .Net framework and API calls. It solves the problems the standard .NET SerialPort implementation has. The demo version is fully functional, but it displays a nag dialog (the licensed version will, of course, not have a nag dialog). The package includes demo programs for C# and VB.NET for Visual Studio 2010, 2012, 2013 2 015 and 2017, Winforms and WPF. A help file is also included or you can use the online documentation.